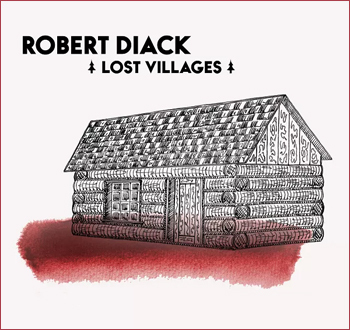 The slow, haunting wave of music from the start of Lost Villages by Robert Diack is immediately discernable as an intimation of something dark and portentous. Its ambience have been created by the gathering gloom of “Displace”, featuring Mr Diack’s restrained brushwork on the drums and the atmospherics of guitar, piano and bass to recall the momentous event when the nine Lost Villages were submerged in the great onrush of water that came with the opening of a large cofferdam. Its water engulfing and submerge the villages in Cornwall and Osnabruck in 1958. The theatrics continues in the subsequent music of “Bittered”; in the rolling thunder of the drums and in the liquid roar of the guitar and bass, by which time we are deep into the story, one from which Mr Diack seldom departs in the rest of the music. The playing throughout this rather short album – quite strikingly in the pyrotechnics of Patrick O’Reilly’s guitar – is blessedly free of any loose (but) metre-driven angularity and stasis that often besets music related to narratives as extreme in nature as the events of the submerging of whole communities. Melodic invention is curvaceous, natural and discreetly sensuous. The tonal palette if refined (a prime requirement when electronic devices subsume the harmonics of guitar and piano) and the pervasive polyphony of the music becomes eminently clear but never ostentations. Not surprisingly, Mr Diack does not fall prey to the temptation to either under-write or over-write the material. Instead he seems to rely on highly suggestive devices such as the delicate brush-strokes on the cymbals, or – in the case of Jacob Thompson’s pianism – the use of a sostenuto and the sustaining pedal, while Mr O’Reilly matches it all with his battery of pedals to broaden the range of effects used in the music. This, together with Brandon Davis’ clearly articulated, but deep dives on the bass, has a magical effect on the music of “Reliquary” and “Sap”. The haunting beauty of the music has been accentuated by some masterful engineering throughout.